Yesterday morning I went to San Salvatore in Lauro as a confessor for the Year of Mercy. 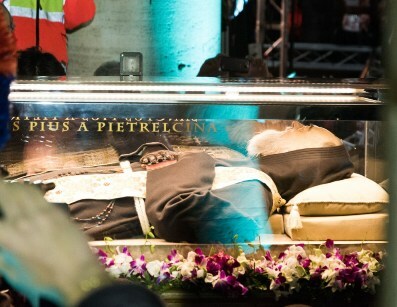 Unlike the previous few times, this time was special, because the day before the bodies of St. Pio of Pietrelcina (Padre Pio) and St. Leopoldo Mandić were brought to the church as two of the holiest confessors of the twentieth century. 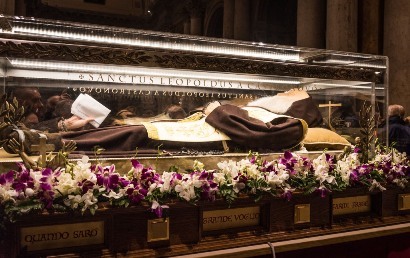 San Salvatore in Lauro is one of the churches being used in the area a St. Peter’s Basilica as a sort of antechamber for pilgrimages during the Year of Mercy: I and other priests are helping as confessors there, and, in this case, our two Saints were being kept there for a few days. Yesterday afternoon were taken in procession to St. Peter’s Basilica, where they’ll be kept at least until Ash Wednesday. I arrived around 9:30 am for a morning shift, and there was already a long line waiting to spend a moment in front of the Saints. 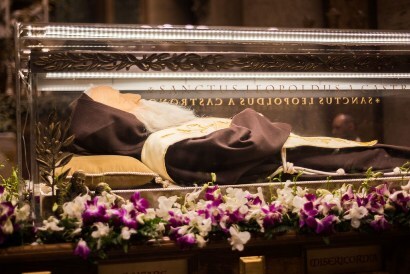 Most of the attention was focused on Padre Pio, since he was more well known internationally, but St. Leopoldo Mandić was another Capuchin, a Croatian who prayed for Christian Unity as a special intention and lived in Padua and was known for being as gentle and easy on his penitents as sometimes Padre Pio was severe and demanding. 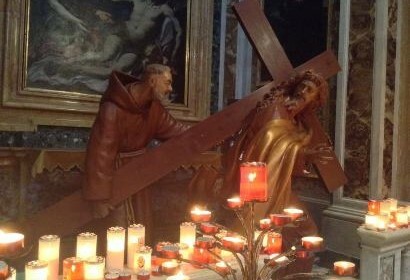 They both spent long hours in the confessional for the sake of the faithful and knew each other. When I signed up as a confessor for that day I’d hoped I could hear confessions in the presence of two great religious, priests, confessors, and saints, and I was not disappointed. There were 6-8 confessors scheduled to be in the church during these days. 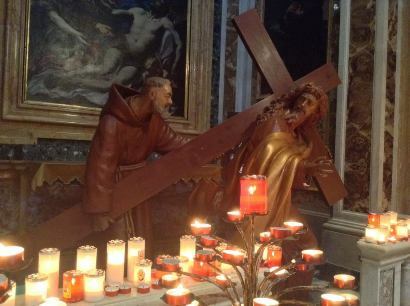 When I arrived the usual confessionals were full (and had lines), so they put me in the back of the church near a huge statue (slightly larger than life-sized) of Our Lord bearing the Cross and Padre Pio behind him helping him carry the cross. So there I was, dispensing Our Lord’s mercy at the foot of the Cross through administering the sacrament of Reconciliation. In all I was hearing confessions for four hours, some hours non-stop, but at midday there was a pause of about 45 minutes while they did a security check before the procession. Outside of that moment the church was full, and my confessional was right by the line of people filing through to see the Saints. Lots of foot traffic and great location equals good “business” (or, in this case, lots of confessions). Mass was celebrated every hour and a half: I was confessing during three of them and left just before the fourth one started. I went a little over shift, and as I was hearing the last confession my substitute came into view (maintaining a respectful distance) and had to confess someone standing there while I was finishing up. On the way back to the sacristy someone else asked me for confession and I pointed them toward the statue where I’d spent four hours and said the magic words: “no line.” As a last enormous grace, after I changed in the sacristy and prepared to leave, I had the opportunity to go right into the sanctuary, since Mass hadn’t started yet, and place my hands on the casket of each Saint and pray for my penitents and my priesthood. After four hours it was the best conclusion I could hope for a morning full of mercy. Pray for confessors, and pray that everyone goes to Confession who needs it.